Technically I’m not sure you can call this salmon salad nicoise. Tuna instead of salmon – that would be closer. Add some anchovies. Then it would be nicoise. But it’s in the ballpark – riffing on the concept. And it’s a dead easy, tasty weeknight meal. For this dish I like my fish a bit translucent. That’s me. Do as you like it. If you like sushi – go for translucent. Much better flavour and texture I think. Try it sometime. You might surprise yourself. If you don’t like it, just throw it back into the pan and cook it some more. The potatoes and beans will keep just fine. Try this dish when the vegetables are at their peak. This is simple food. There is nowhere to hide bad ingredients. Cook each ingredient separately, toss the vegetables in a simple dressing. Garnish with the eggs and olives. Enjoy! 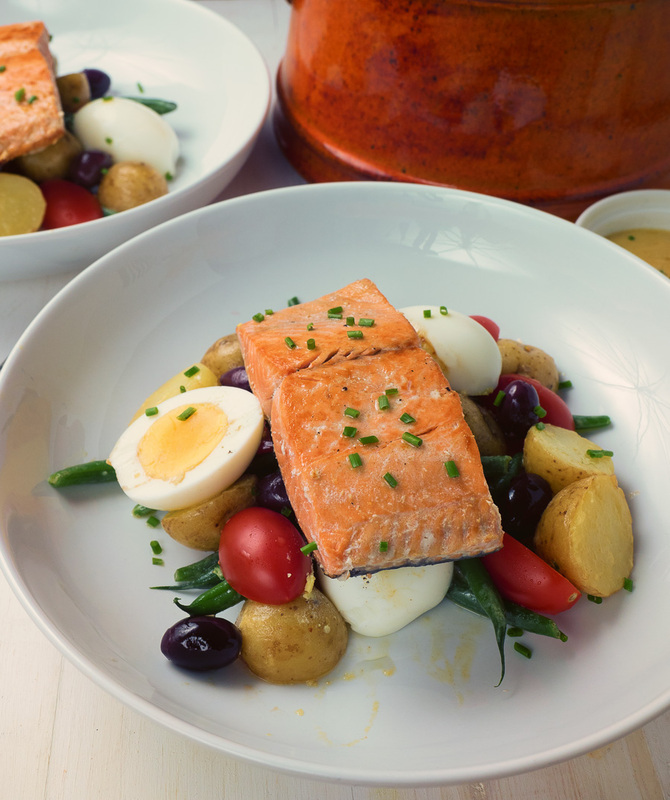 Salmon nicoise makes a fantastic lunch or light dinner. It's perfect when the late summer and fall market produce is at it's peak but you can make it all year around. Fill a saucepan with enough cold water to cover the eggs by a full inch. Bring to a boil over medium high heat. When the water boils remove the pot from the heat, cover and let stand for 10 minutes. Set a timer. After 10 minutes, remove the eggs from the hot water and plunge into ice water to stop the cooking. Boil the new potatoes in salted water until done. Once done, drain and set aside. Bring water in the same pot to boil, add salt and beans. Blanch the beans. You want them just barely done. Drain the beans into a colander and run cold water over them to chill. This stops the cooking and keeps the colour and texture intact. Gently pan fry the salmon in a bit of butter over medium-low heat (no hotter). Watch the sides of the fish. If you want translucent, leave a good bit of translucent in the middle of the edge of the fish. If you want flaky, cook until it's just evenly coloured. 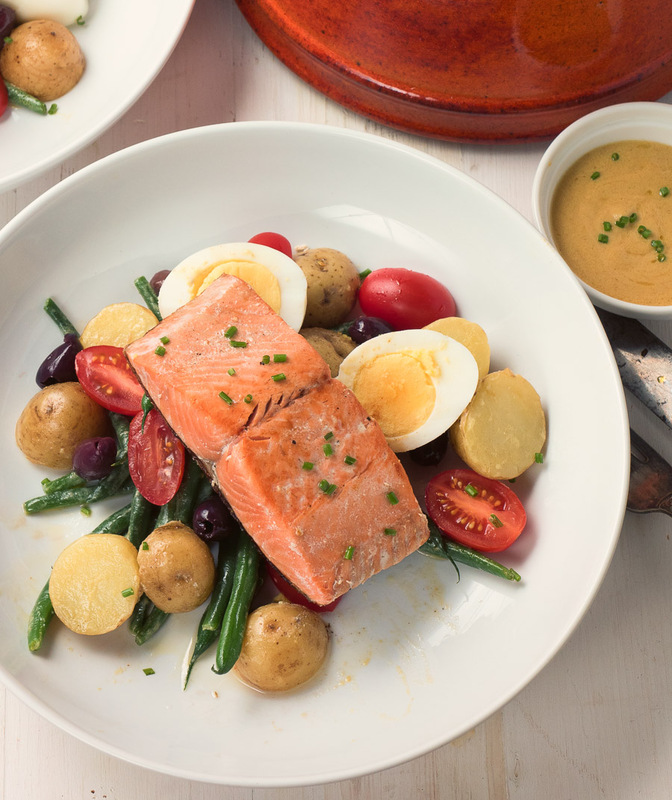 Combine the beans and potatoes, add salt to taste and toss with simple french vinaigrette. Be gentle - you don't want to smash the potatoes. To plate, divide the bean/potato mixture into two bowls, add the tomatoes, olives and egg. Top with the salmon. Garnish with a bit of finely minced chives if you like. The hardboiled egg technique is from America's Test Kitchen back in the early days. I still haven't found a better or more reliable way to get perfect hardboiled eggs. The French vinaigrette recipe can be found here. In american, french, main course, seafood. Bookmark the permalink. Gorgeous rendition of this classic salad. Your salmon looks perfect.